Sol Lewitt and David Tremlett. a painted paradise with harps”. Though less distinguished than the art and architecture of Florence and Venice there is no shortage of instructional decoration in the churches of Piedmont. There are no harps, however, outside or in the recently restored and decorated Madonna delle Grazie chapel on the hillside of Brunate nearby La Morra (opened early September). Yet it does have something of the character of a painted paradise, or at least of a place of joyful celebration. The structure is small, brick-built in a reduced baroque form, and stands in a vineyard from which is derived a deep-red, fruit-heavy Barolo. The immediate surroundings are dry and dusty and until this year the chapel stood in a state of dereliction, unused and unusable. Now it is a flaming fire of bright new colours rising up out of age-old muted browns and greens. Art has been applied to artefact in a quite extraordinary way. The chapel now sits like a candy-stripped kiosk or a carnival tent, suggesting that at any moment performers might tumble out to the sounds of drums and trumpets. These effects and expectations are the result of Sol Lewitt’s multiform exterior wall drawings. From the austere, concept-driven exercises in pencil of the 70s Lewitt has moved by stages to deep colour saturation. Hitherto permutation and combination remained guiding intellectual principles of his serial art making, but the Chapel exterior suggests an abandonment to the sensuous for its own sake: the wild dance of shapes and colours is choreographed not as the expression of an idea but in pursuit of an effect. Fittingly for a place originally created for prayer, as one enters the Chapel things quieten and slow down. Lewitt’s carnival fanfare gives way to an exercise in gentler rhapsody: reveille yields to reverie. For twenty years David Tremlett has been massaging pastel into the surface of walls. From ruins in Tanzania to the Serpentine Gallery he has laid pigment upon plaster in a distinctive and highly individual series of abstract drawings. For a long while the forms were those of ground plans transposed in elevation; but in this decade they have become more Rothko like – floating clouds of colour. Four roughly rectangular forms dominate the ceiling suggesting a curious colour transformation of the sky beyond. By contrast the walls are blocked in more or less solid colours though sparsely veined by gaps between the pastel. One such line drifting diagonally across the small apse divides it blood-red above and sky-blue below, again suggesting an inversion of nature – though these effects may be unintended. The floor is laid with grey, green and red marble and the widows are stained glass, all executed to Tremlett’s design. This is an extraordinary project. It is inconceivable that it could have happened in Britain and it is to the credit of those involved, in particular the Ceretto family (the vineyard owners) that it happened at all. But the question arises of the point of the exercise. Neither the exterior nor interior is evidently religious art. 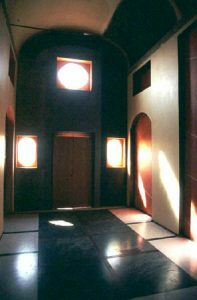 In fact Lewitt is quoted as dissociating his design from any function that the building might have “I didn’t see it as a church or a chapel, not even as a building, but as a thing to be used to make a work of art”. Tremlett is more mindful of its religious identity and his part in the project included a commission to design a set of priest’s vestments. Even so he conceived his plan in formal terms, purely as a treatment of a space rather than as an aid to worship and prayer. Lewitt and Tremlett regard themselves as sculptors not painters and their work certainly takes into account the effect of line and colour on the experience of solid and void. The question more likely to be asked, therefore, is not what kind of art is this? but is it art or decoration? So put the disjunction seems a false one. After all Fra Angelico’s cloister frescoes were designed to be both. The real issue is whether these wall-drawings achieve the status of art. On balance I think they do, though the risk of slippage into simply decorative effect is certainly there. Travelling to Barollo from Milan my companions and I visited Pavia to see the Charterhouse and San Pietro in Ciel d’Oro. Also dedicated to the Madonna delle Grazie, the facade of the former is perhaps as Jacob Burckhardt wrote ‘the most imposing, beautiful and decorative monument in Italy’. The exterior of the latter by contrast is unremarkable. Yet within are wondrously entombed the remains of the two greatest intellectual mediators between antiquity and the middle ages. Above the high altar Augustine is honoured by ranks of carved figures; while in the crypt the remains of Boethius are cradled within a simple alabaster casket. The contrast in artistry between Pavia and Brunate is too great and obvious to comment on, but it raises a question that needs attention. The renaissance muralists and sculptors strained to effect a kind of transcendence in which matter might almost be spiritualised and philosophy enmattered. We pride ourselves on conceptual sophistication but it is hard to see that our governing ideas could ever inspire greatness. Ludwig Wittgenstein once wrote that “Architecture immortalizes and glorifies something. Hence here can be no architecture where there is nothing to glorify”. The Brunate chapel is unpretentious, cheerful and celebratory; but I would encourage the artists to look to the example of the past and to set their sights higher – if not on higher things.